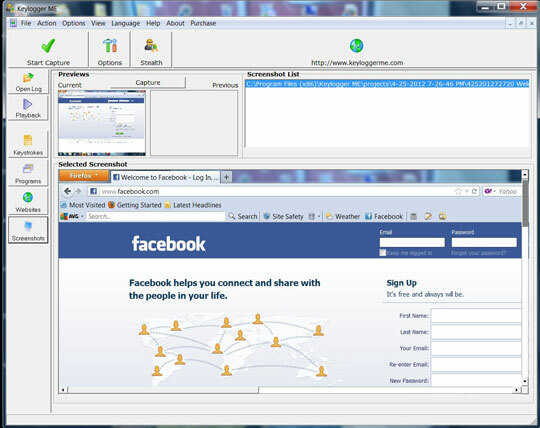 See more screenshots of Keylogger ME Keystroke Keylogging Software here. Vulnerable Children who view and even contribute to X-rated material, chat and meet online predators, read and assimilate violent or hate filled material all the while keeping it a secret from his or her parents. The Online World of the Internet, Bad Motives, Secrets and Lies are sadly the reality of cheating significant others while the innocent mate is oblivious to what is going on. Secretly using dating sites or social networks the cheating mate is unfaithful. For business owners, time and resources that should be used to progress your business are wasted by employees who seek to have a "good time" on the internet while they are on the clock being paid by you. If after looking at those scenarios you say, "that could never happen to me" - it is likely that you are DEAD WRONG!!! There are literally thousands of social traps that exist on the internet. The three mentioned are just a few of the things that can go wrong with a computer and the internet. Every day these social traps are changing and getting worse. The wrong stance to take is to close your eyes and hope for the best. Having studied (using Keylogger software) the cases of real people who have seen loved ones or business associates fall prey to the dangers and waste of the internet, almost all of them follow the same trend. No one suspected anything. It was only when it was too late or critical that the problem was discovered. DON'T BE TOO LATE! Take action! Instead of waiting until these, unknown to you, issues reach a boiling point take action now and avoid these nightmares. Saving you much heartache and your loved ones or business. This is a simple measure that you can take that will prevent these dangers from ever laying waste to your family or business. Keylogger ME can easily be installed in your computer and will stealthily track every web site, online message, email, software, keystroke, everything that goes on with your computer. Without anyone but you knowing. You are the only individual privileged to see what others are doing and communicating online. What is keylogger software? A keylogger is a type of software that tracks everything that goes on between the computer and computer user. This is all done with only the keylogging owner, YOU, knowing of the existence of the software running. All other computer users are unaware of its data collection. It's quiet, untraceable, undetectable and extremely effective. Keylogger ME software is more high-tech, efficient and effective than anything else on the market. And that is because it has been designed off the platform Experts regularly use. You get the same (keylogger) methods we use to track computer users in the computer securities field. The only difference is it is simplified for the average computer user to pick up and start using to monitor right away. Don't be tricked into using another keylogger software that is only making claim to help you. You'll find other keylogger software makers providing buggy, overpriced, and possibly unsafe software to install on your computer. With Keylogger ME you are getting cutting edge software technology that is safe, simple, and works undeniably well. Tracks all websites visited - see where all computer users went online when they were alone. Records all keystrokes made on the computer - particularly beneficial for reading others online chat and emails. Retrieve account names and passwords at web sites like Myspace, Facebook, Gmail and Yahoo Mail. Tracks all web browsers include Internet Explorer, Firefox, Chrome and more. Not affected by invisible mode features found in most browsers. Tracks web sites visited 100% of the time, guaranteed. Find out all the programs that were used on the computer - monitor video games played and programs accessed. Snap shots of the computer screen recorded in timed intervals - giving an added layer of monitoring. Stealthily runs in the background of your computer - only you know it is running and recording data. Option to email collected data to the email address of your choice on a daily basis. Easy to use and includes video instructions. Runs on all Windows Operating Systems (including Windows 8).